Jean Phillipe Latreille (La-Tray) was born in Montreal, Quebec on April 22nd, 1938. “Phil”, as everyone called him, emerged as a star forward for his high school team at the D’arcy McGee School in Montreal. It was there that he caught the eye of over 70 colleges and even two professional teams, the Chicago Blackhawks and Detroit Red Wings. 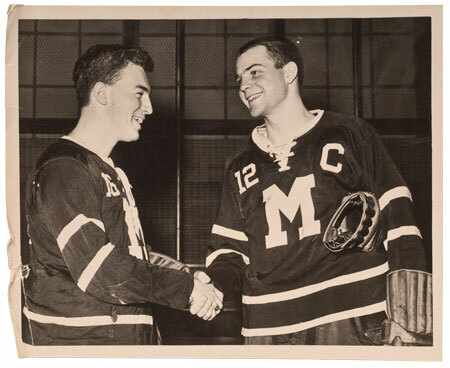 During this time, Phil received a visit from then Middlebury hockey head coach, Duke Nelson. It was because of this visit, Phil says, that he would go on to choose Middlebury College as his place to make collegiate hockey history. In his own words, Phil recalls, “The real reason I went to Middlebury was because of Duke Nelson. I can still see him talking to my mother in our little apartment. Duke had that look in his eye, and he told her he’d take care of me, so my mother said, ‘Middlebury, that’s where you should go to school’”. 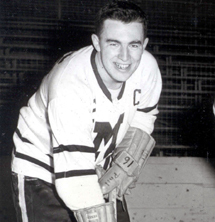 Latreille enrolled at Middlebury in the fall of 1957. In a time when there was no separation of divisions like there is now, Middlebury played against many schools that are today known as Division 1 powerhouses. Nevertheless, Latreille excelled on the ice, making himself known as one of the most prolific scorers in the game. He was infamous for his blistering slap shot, which, as current day head coach Bill Beaney notes, “was so far ahead of his time”. Because freshman could not participate in varsity sports, over three seasons of play at Middlebury, Latreille racked up 214 goals and 80 assists for a total of 294 points. These numbers include setting seven NCAA records, including most goals in a game (10 against Colgate in 1960) and most goals in a season (80 in 1961). These records, along with five others, still stand today. Latreille served as team captain his senior year, and was named ECAC All-Second team in 1959 and ECAC All-First Team in 1960 and 1961. Following the completion of his Middlebury season in 1961, Latreille signed a tryout contract with the New York Rangers. He would go on to play four games that season for the Rangers, before spending the following three seasons with other minor league teams. Although his stint in the NHL was short, it came at a time when there were only six teams in the league, making his appearance all the more significant. Today, Phil is coveted as one of the most successful athletes to have passed through Middlebury College. He currently has a plaque in his honor hanging just underneath the Canadian flag in the Chip Kenyon Arena. 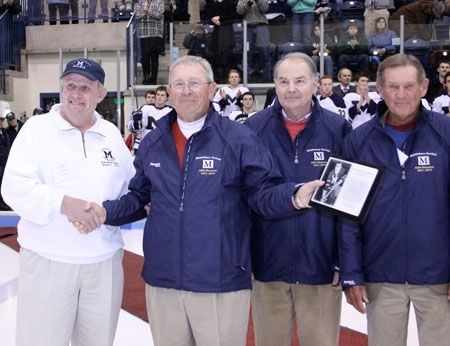 His impact on the game of hockey however, extends far beyond the confines of Middlebury College. He will forever be known as one of the greatest scorers to ever play collegiate hockey. Without his contribution to the sport, the NCAA record book would look noticeably different. Phil raised three children with his late wife Eileen, whom he met at Middlebury College. He was recently inducted into the Vermont Sports Hall of Fame.